One of the most common ways of death in Skagway was not murder or disease, but curiously, drowning. Skagway is a port town and ships come and go all the time. These days, the docks are wooden and concrete, but around the turn of the century they were just wood. As any local resident knows, wood becomes slippery and so you generally walk in the street or walk with ice-creepers if you take the boardwalks. Although the Skagway Death Record says he died on October 30, 1907, the Dawson Daily News pinpointed his death on Friday November 5, 1907. Since by December they still had not found the body, it must of sunk to the bottom of Lynn Canal. His is not the only body to disappear in the frigid waters. In any case, in the winter, be careful when walking on the docks and don’t lean over if you hear a peculiar cry coming from the water below. 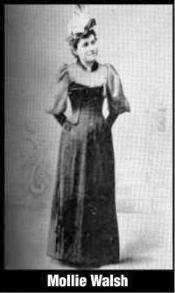 Probably one of the most famous women of Skagway, red-haired Irish descent Mollie was a waitress and church helper, coming here with Rev. Dickey in the goldrush. She was a kind person and everyone loved her, so why did her husband murder her on October 28, 1902 on a street in Seattle? Mike Bartlett claimed it was a “crime of passion” but later committed suicide leaving their son Leo an orphan. 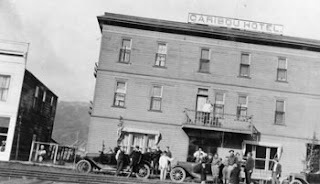 Bessie and Edwin Gideon built and owned the Caribou Hotel in Carcross (home of Polly the Parrot). They lived there for many years and Bessie died on October 27, 1933 on the third floor. It is said that she still haunts the hotel (does Polly sit on her shoulder?). The Hotel is undergoing a complete re-modeling after the murder of the latest owner a few years back, and should re-open soon. Edwin had died in 1925 and is buried in the Carcross Cemetery, supposedly so is Bessie. Bessie Trusty had married Edwin Wallace Gideon before 1898 according to a Gideon family website. On October 24, 1918 the Princess Sophia with all 356 human passengers onboard sank after running aground on the rocks at Vanderbilt reef in the Lynn Canal. There were however, two non-human survivors: one was a dog that jumped ship and swam ashore to save itself (very un-Lassie like, surely he could have dragged a couple of women and children ashore with him). The other survivor is less known: Polly the Parrot. Now Captain Alexander and his supposed wife left the mine near Atlin to head south for a holiday (like many of us do these days). Along the way he dropped off his parrot, Polly, who he claimed was over 45 years old, at the hotel in Carcross which also had a bar. When the good Captain and “wife” did not return Polly was left in Carcross where he spouted obscenities at the patrons for the next 50 years. When Polly died he was buried in the Carcross cemetery with a little brass plaque near the gate. Over the years people have added little toys to the grave, although I admit I haven’t been there in 2 years. When the courts were settling the estate of Captain Alexander, his wife and daughter in England set the record straight that they were not with him on the Princess Sophia. Then who was this mysterious woman who drowned? Hmmm, the clot plickens…. In this photo Capt James Alexander is seated in the middle and “Mrs. Alexander” is holding the bird in the doorway. Judge Isaac Newton Wilcoxen and Judge James Wickersham, both judges in Skagway in the early years, both died on this day. Judge Wilcoxen died at the age of 73 on October 23, 1910 in Seattle and since he was a Civil War vet is buried in the GAR cemetery there. I.N. Wilcoxen was a member of the Arctic Brotherhood in 1900, a Judge in 1902, and member of the school board. He was also a lawyer and notary public in 1901. Judge Wickersham died in 1939 in Juneau. He was elected as Alaska’s first delegate to Congress, serving until 1917 and then being re-elected in 1930. He was instrumental in the passage of the Organic Act of 1912, which granted Alaska territorial status, introduced the Alaska Railroad Bill, legislation to establish McKinley Park, and the first Alaska Statehood Bill in 1916. 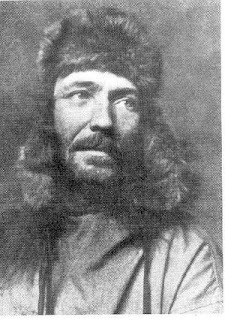 Wickersham made the first climbing attempt on Mount McKinley in 1903. In 1927 he wrote: A Bibliography of Alaska Literature 1724-1924 published by the University of Alaska press. In 1938 he wrote Old Yukon: Tales & Trails and Trials. In Fairbanks, Judge Wickersham’s house is open to the public and is listed on the National Register of Historic Places. 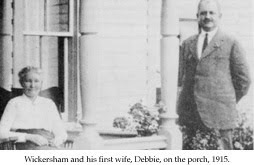 The picture above is of he and his wife Debbie in 1915 on the porch of that house. Lepha was the daughter of Captain James Bennett. In October of 1897 she threatened to shoot a man in Skagway who was abusing his dogs. She married Jesse L. Edgren and moved to Dawson where she had a baby, Mae Eldorado Edgren in December 1898. Unfortunately Lepha died of typhoid January 6, 1899, leaving Jessie with newborn Mae. Jessie took the baby back to Wisconsin to the grandparents. He then died there in Hennepin, Wisconsin in 1915. There is a record in the Fairbanks newspaper that Mae Eldorado Edgren died in 1921 perhaps in Alaska, so it would seem the family suffered another Alaska tragedy. This photo of Lepha’s funeral procession led by her faithful dog team was probably taken by Larss. from: Mills p. 14; Larss photo at AK State Library; Andromeda Romano-Lax “Mothers of Gold” 1997. Happy Birthday to little Hazel born in Skagway on October 18, 1899 to the famous White Pass & Yukon Route photographer Harry C. Barley and his wife Dora. 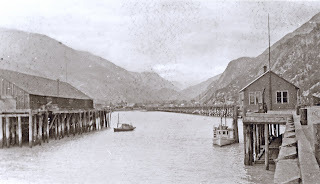 Barley was a late-comer to the gold rush and established an office in Skagway in 1899. He became the official photographer for WP during and after construction of the railway from Skagway, Alaska to Whitehorse, Yukon. Barley died, shortly after the Klondike Gold Rush, in San Francisco of consumption. The Yukon Archives has the most complete collection of Barley’s professional prints, including 500-700 prints of life in Skagway, WP&YR construction and various Yukon and Alaska communities. The Guv got his start here in Skagway in 1898 as editor of the newspaper and participant in the famous “Committee of 101” who stood up to the Soapy Gang. He moved to Juneau after that and remained there for many years, succeeding Governor Clark who resigned in 1913. He was born on October 15, 1856 in New Brunswick Canada and married in 1896 in Salt Lake City. His wife, Annie Hall, was 20 years his junior and worked as his reporter for Skagway Newspaper. He died in 1923 at the age of 73 in Seattle of a heart attack. The leader of the strike was a young man born on October 10, 1879 in Reading, England, John Robert White. He had joined the Greek Foreign Legion in 1897 and then came to Alaska in 1899. In Skagway, the confrontation with White Pass Engineer Mike Heney and Dr. Whiting resulted in Dr. Whiting striking White on the head with a shovel. White was sent to Sitka and jailed for 6 months. After that, White joined the military and served with the 4th Infantry in the Phillipines where he rose to the rank of Colonel. He retired from the U.S. military in 1914 and went to Europe and served for the Red Cross and the new Rockefeller Foundation (establishing medical proceedurs). He then joined the A.E.F. in WW 1. In 1920 he joins the U.S. National Park Service. He started as ranger, then chief ranger, then Superintendent of such parks as Grand Canyon, Sequoia, and Death Valley. He then became Regional Director of two regions in the Park Service in 1940-41. White died in Napa, California in 1961 at the age of 82. Today in Skagway the White Pass and National Park work amicably together, unaware of the history of John Robert White. 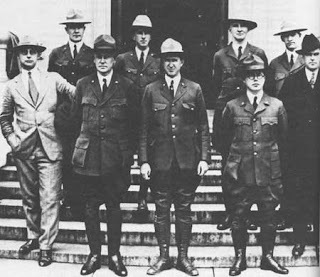 The photo above shows the Washington staff of the National Park Service in uniform in 1926. 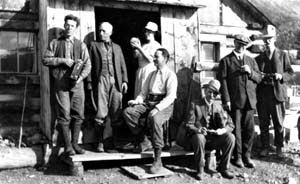 Left to right: Arno B. Cammerer, assistant director; Harry Karstens, superintendent of Mount McKinley National Park; Stephen T. Mather, director; Charles G. Thompson, superintendent of Crater Lake National Park; Horace M. Albright, superintendent of Yellowstone National Park; John R. White, superintendent of Sequoia National Park; Arthur E. Demaray, assistant director; Ernest Leavitt, assistant superintendent of Yosemite National Park; W. B. Lewis, superintendent of Yosemite National Park. This famous mountain climber started out as an Episcopal Archdeacon of the Yukon. His party climbed McKinley in 1913 and he later wrote “Voyages on the Yukon and its Tributaries” and later “Ascent of Denali”. He died of pneumonia in Ft Yukon on October 11, 1920 when only 55 years old. He was born in London England in 1865.